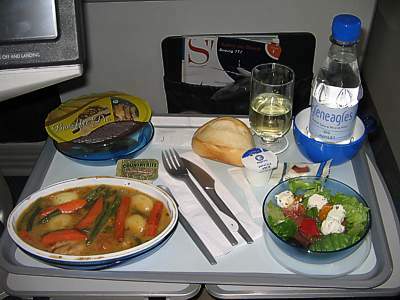 BA have reintroduced metal cutlery on most flights, including Club Europe. 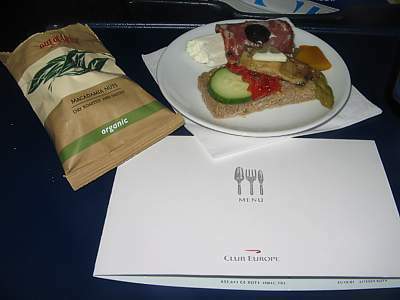 If you are travelling in Club Europe (trans-European Business Class) the food you get is determined by the scheduled departure time, and the the "band" of your destination. 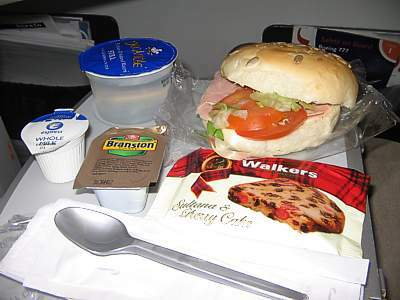 Food is slight different - and better - if you are travelling from Gatwick rather than Heathrow, although your experiences may vary. 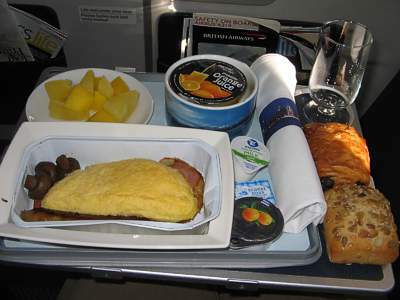 In club Europe there is always Hot Breakfast from 0600 to 1000 (unless you are in Band 1). From 1130 to 1400 you get lunch. From 1400 to 1630 there is High Tea (basically, sandwiches with scones) and from 1630 Dinner. Want to see BA's full Product, Service & Delivery notes to BA Staff? 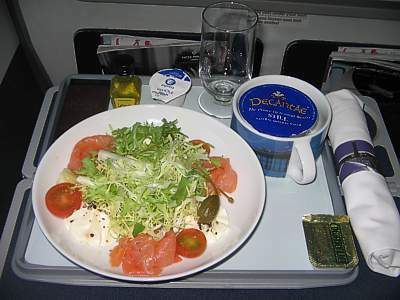 The longest distant (DME, LCA, ATH, IST) Club Europe flights - band 4 - get hot meals at most times. 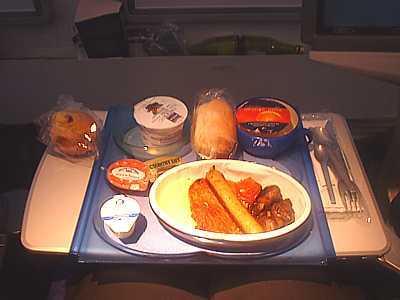 Band 3 flights (eg: MAD) get hot meals at lunch and dinner times. 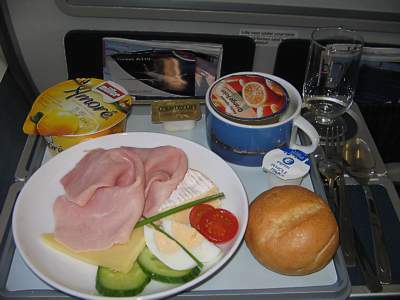 Band 2 (TLS, DUS) only get a hot breakfast, mid mornings just get ham & cheese with a roll, lunch can be something cold on a bed of salad, then it just turns into sandwiches (including the 1605 to DUS), until dinner has something cold on a bed of salad again. 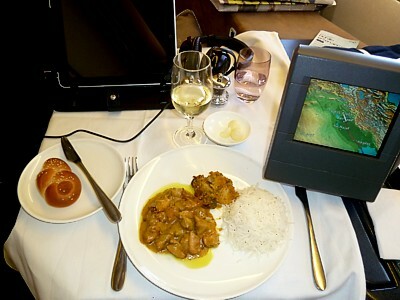 Band 4 food can almost seem like longhaul, with special Club Europe menus, and a choice of hot options. You initially get your tray, with the starter and desert on it. When you've finished the starter, that plate is removed and replaced with the main course. Ironically, however, band 4 food in economy comes the closest to that in Club, with hot meals throughout the day, a starter, and a desert. 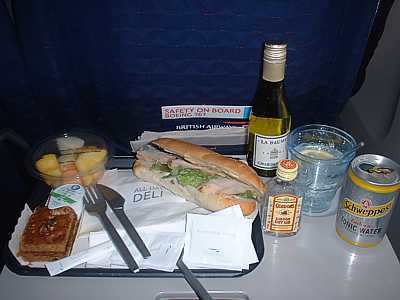 On the longest of long Band 4 flights (eg: DME) on the 767 in additon to the main meal you can request a snackbox with sandwiches, biscuits, & a bottle of water. On most services, service begins at the front, where the front row is often reserved for gold card holders. 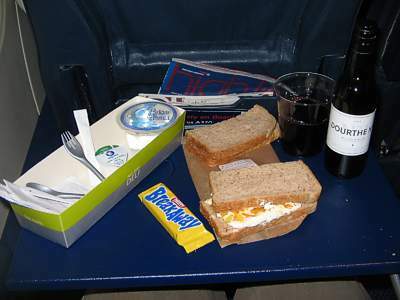 To band 2, all service is food and drink from one trolley, from the front, right side first. 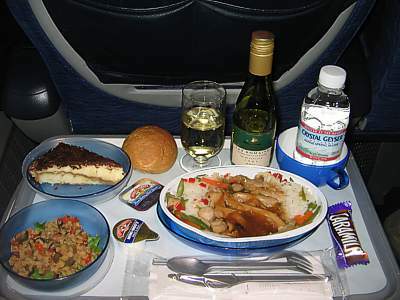 That means it is vital to sit in row 1 to get quick service (Indeed, by the time they get to the back of the CE cabin, you can already be starting the decent) except if the CE cabin is longer than 5 rows, in which case there will be two trolleys, one with drink and one with food. 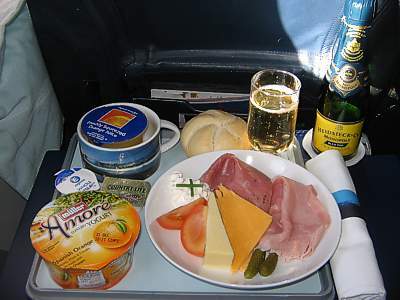 In band 3 & 4 for single isle aircraft service is from the galley, where you are asked for your drink as well as making your food choice except if the CE cabin is longer than 5 rows, in which case there will also be a drinks trolley. Other variants exist. Your service may vary. In Euro Traveller on the 767s there is just one trolley per isle, that starts at the front of the cabin. 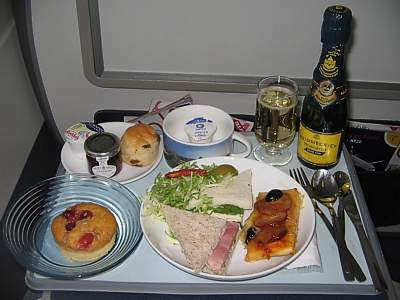 The afternoon tea service in Club Europe can sometimes be pretty poor - particularly on the return legs back to Gatwick or Heathrow, where the meals were made often 8 or 10 hours previously. 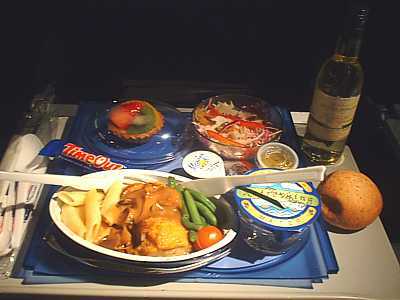 You can however get around this by requesting a special (SPML) meal normally comes on a full tray, and is pretty good. 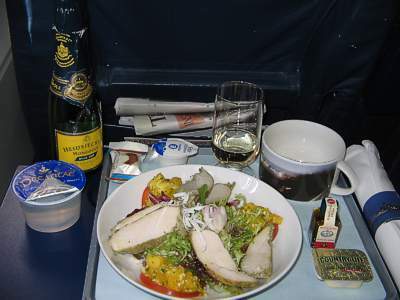 In First Class you can dine when you want to: you don't have to launch into a heavy meal when the flight starts, and indeed if you've indulged in the Concorde Room, its probably best you wait. 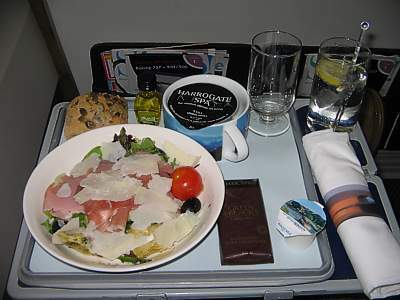 British Airways First Class inflight meals are definately way above what is served in Business, and it is served as an indulgent five course meal. 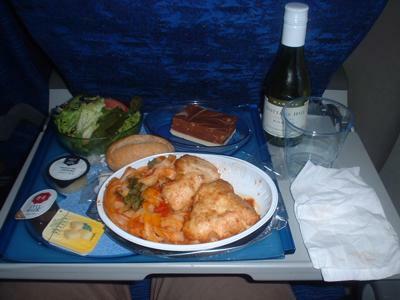 In First Class you will get two menus, one with food, and the other with the wine list. Although it is designed that you have a starter, soup, main, dessert and cheese, you can of course choose several starters: indeed, many First regulars recommend taking three starters rather than the main: they are tastier, and not so filling. You can also choose from the Bistro selection, with smaller pasta and sandwich selections. 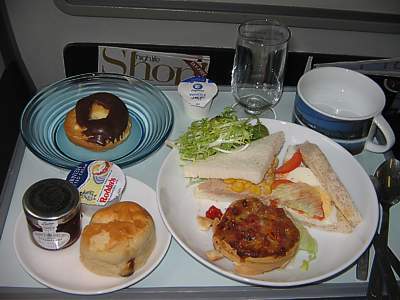 For the second meal of the flight, Britsh Airways Afternoon Tea (eastbound) or Breakfast (westbound) is served. For Afternoon Tea, you have a choice of sandwiches, scones, or cakes. You can of course take all three. Mint coated melon with thin slices of air-cured duck. Half a lime. Hot roll. Butter balls. This doesn't look anything like you'd expect it to look, but this really is a mint flavoured soufflé surrounding to a melon, with lovely delicate flavoured duck. Truffled Foie Gras with quince jelly and warm toasted brioche. Rich, buttery, and delicate, this goose liver has quite extraordinary flavours, and goes well with the quince jelly balls. It's highly recommended. Crab salad timbale with asparagus puree and tartar sauce served with lemon vinaigrette. A small inconsequental starter, but pretty good. 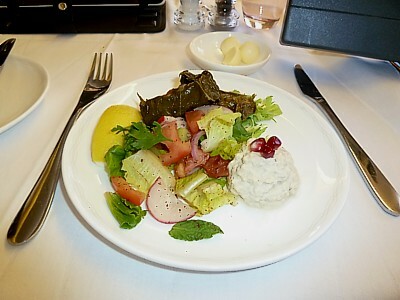 International meze plate of mutabbal with pomegranate seeds, including lettuce, half a baby lemon, and labneh. What a starter. Mutabbal is a traditional Palestinian Eggplant Salad, and it is served from many arabic countries. It is made of roasted, peeled, and mashed aubergine, blended with tahini, garlic, salt, white vinegar and lemon juice. It is served as is normal with a dressing of oil and pomegranate concentrate. The Labneh (strained youghurt with herbs) is top notch. Alas there isn't much quantity, but then again it is only a starter. Twice-backed Cheddar soufflé with piquillo pepper and basamic dressing. Now this is weird. Really unusual, but there is nothing wrong with that: indeed, it has flavour you may not have tasted before. The question is, is it a starter or a main, or even a dessert? Masala tomato lentil soup with diced tomato and cilantro served with toasted naan bread. 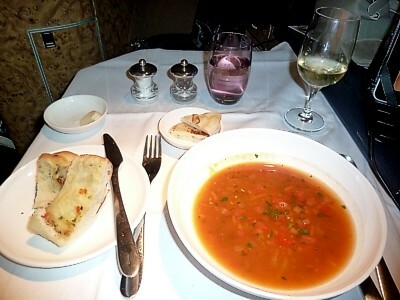 What makes this soup better than so many in First class is the toasted naan bread: really very good and worthwhile. 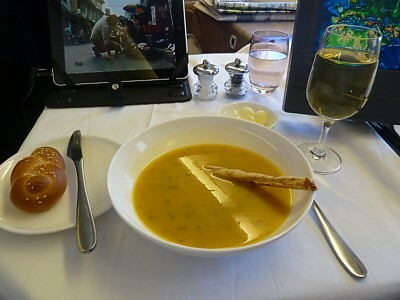 Pumpkin Soup with a cheesy breadstick and hot roll. Decent pumpkin soup, with a few herbs: nothing special, but not too bad. Fresh salad leaves with cream cheese and chive dressing. A classic salad, such as you might get at Wetherspoons. Its lovely and fresh though, so there is nothing to really fault here. Fresh autumn salad with golden rapeseed oil & creamy beetroot dressing. This is just a pretty standard salad, with parmasan cheese shavings on top of a bunch of iceberg and rocket. Murgh handi lazeez, cauliflower and broccoli masala served with steamed basmati rice and poppadoms. Chicken in a spiced yoghurt sauce, seasoned cauliflower and broccoli with steamed basmati rice and flatbread. This is very much a bad choice. 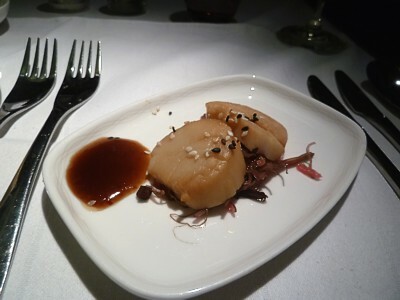 For a start, the qantity of this main course is very small: indeed, it looks like a starter. And then there is the flavour and texture. It's just poor from begining to end. Alas, if you're looking for a decent curry, you'd be better of in Brick Lane. Fillet of Herefordshire beef with caramelised shallots and Parmentier potatoes. Bad through and through. 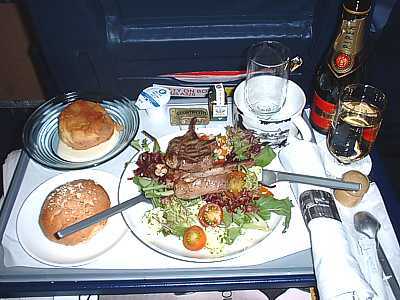 BA have a problem with steak on board First, and rarely is it any good. Indeed, it is often tough and inedible. Agnolotti pasta stuffed with morel and portobello mushrooms served with Cajun Alfredo sauce and Parmesan tuile. This doesn't look like a pasta, but it is! The pasta is on the bottom, while the mushrooms are sprinkled on the top. This was absolutely fantastic, and one of the best meals of all time in First. A really good gâteau, it's almost as if afternoon tea has come very late (or early). This is a lovely dessert. The presentation is just right, it is not too chilled. Great. Chocolate roulade with whipped cream and strawberry, plus cocolate straws. Wow this is good. Really very good indeed. There is so much to enjoy in what looks like a yule log straight out of Christmas, and indeed, that is what it really is. Take special note of the cream, even this is delicious. Mature cheddar, stilton, and camembert. 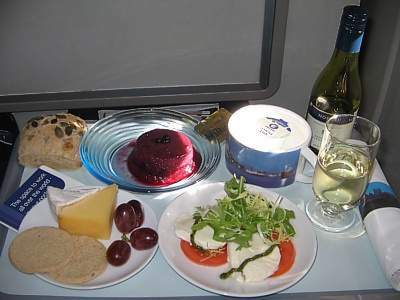 The Cheese Plate in First Class is something of a tradition. 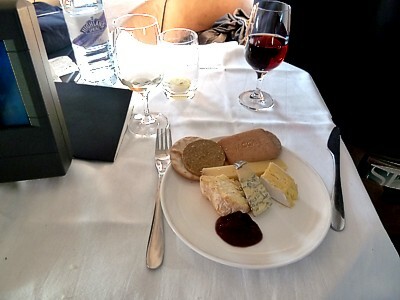 Each flight has a different selection of cheese, and the menu will list tasting notes for them all. Channel island brie, Yorkshire blue, lincolnshire poacher, and Langres cheeses. 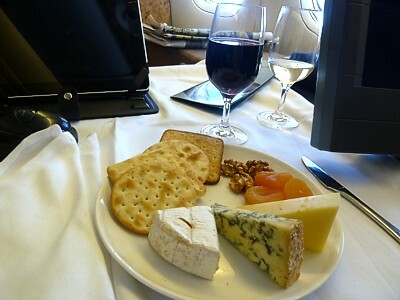 Another Cheese Plate in First Class. 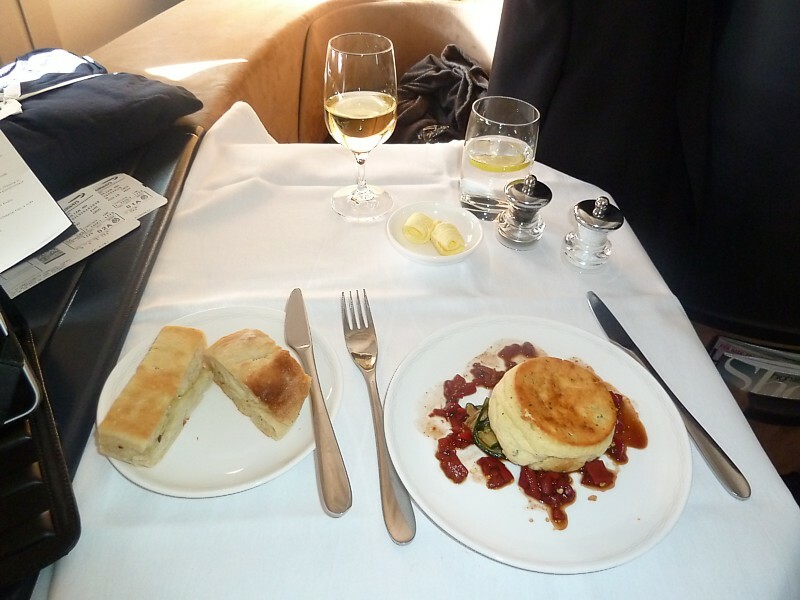 It's unusual to get Langres cheese on a plane: Langres is a French cheese from the plateau of Langres in the region of Sparkling Wine-Ardenne. It is from cow's milk, and cylindrical in shape before being cut. It is also unpasterised, and banned in some countries for that reason. It is delicious. 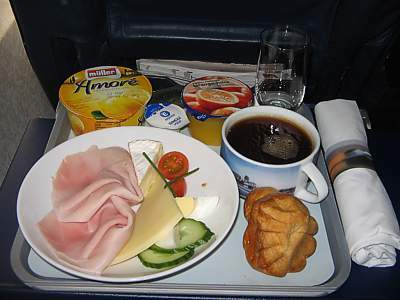 Very dull, but probabaly the only breakfast you'll have room for if you stuffed yourself in the first half of the flight. Traditional English breakfast of scrambled eggs, bacon, sausage, rosti potatoes and cherry tomato confit. Right on the money, this is the breakfast you've been waiting for if you've been missing a good decent English out in the colonies. The bacone is great, soft creamy scambled eggs, and even good rosti potatoes. Yum. One thing you should check for though is that the sausage has been properly cooked: I've had a few that haven't been done quite right. A selection of four sandwiches. Salmon and cucumber, horseradish and cream, smoked chicken with mango, and egg and tomato. This looks like a disapointment: like something you'd get down the back in Business, but actually this is only the first of three servings. Afternoon tea starts with sandwiches, and you get a plate of three to enjoy. Scones served warm with clotted cream and strawberry preserve. Good Cornish clotted cream: nothing at all wrong here. Orange blossom financier with blueberry mousse, black forest cake and mascarpone choux with raspberry. Plain & fruit scones served warm with clotted cream and strawberry preserves. You can of course have the scones and the cakes served at the same time. A small blob of cheese with salad garnish & peppers. Separate side salad. Roll. Butter. Leg of chicken with penne pasta in a creamy sauce. S ide salad. Roll. Butter. All cutlery is plastic, but there's a proper linen napkin on the tray, which also has a china cup and a glass glass. A sausage (English), a strip of bacon (with rind) an omelette (plain), six mushrooms, and a hash brown. A hot roll, with a tub of Country Life butter, and a tub of strawberry jam. A plate of melon and grapefruit. A tub of orange juice. There's also a china coffee cup on the tray, with a pot of milk. This is lovely, just the way to recover from a hangover on an early morning flight. True, the omelette was very plain and even a dose of salt couldn't liven it up, but the hot roll was superb, as were the chunks of grapefruit. A hot roll & a chocolate filled roll, with a tub of Country Life butter, and a tub of peach jam. A plate of melon and grapefruit. A tub of orange juice. There's also a china coffee cup on the tray, with a pot of milk. 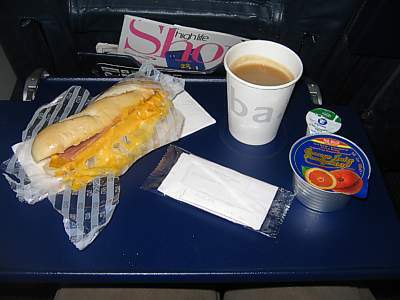 Pretty much the same as above, except to add that the chocolate filled roll is definately the roll of choice on these early morning flights. A sausage (English), two strips of bacon (with rind) an omelette (plain), six mushrooms, and a tomato. A hot crossant with a tub of Country Life butter, and a tub of marmalade. A mixed fruit salad plate of melon, orange and grapefruit. A tub of orange juice. There's also a china coffee cup on the tray, with a pot of milk. The slight variant for band 3 is there is just slightly more breakfast, and you get crossants instead of just rolls. A plate with two slices of palma ham, a slice of cheddar, a slice of red Leicester, a very tiny dollup of cottage cheese, two tomato quarters, two gerkins. A hot roll, with a tub of Country Life butter, and a tub of orange juice. A Muller Amore orange yogurt. There's also a china coffee cup on the tray, with a pot of milk. This is the standard midmorning snack, clearly aimed at those who had missed breakfast. Lovely ham. Lovely cheese. Great yogurt. Shame the roll was so hard it would sink a duck. A plate with a slice of palma ham, a slice of english ham, a slice of cheddar, two slice of red Leicester, a very tiny dollup of cottage cheese, two tomato quarters, two gerkins. Yet another midmorning snack, although this was somewhat larger than normal, and is great if you are in a remote outstation where there is no breakfast in the lounge. Good to have 2 types of ham. Lovely cheese. Great yogurt. A plate with two slices of English ham, a slice of cheddar, a slice of Brie, an quarter of egg, two tomato quarters, two slices of cucumber. A cold fairy cake, with a tub of Country Life butter, and a tub of orange juice. A Muller Amore lemon yogurt. There's also a china coffee cup on the tray, with a pot of milk. Yet another midmorning snack, although this was reduced from the usual size. Sad to see the ham reduced to a cheap English version. Lovely cheese. Great yogurt. A plate with two slices of English ham, a slice of cheddar, a slice of Brie, two quarters of egg, two tomato quarters, two slices of cucumber. A cold roll cake, with a tub of Country Life butter, and a tub of orange juice. A Muller Amore lemon yogurt. There's also a china coffee cup on the tray, with a pot of milk. A third variation of the midmorning snack, although with some slight tweaks. A plate with two slices of chicken in batter, lettuce and chickpeas. Eggplant. A cold roll, with a tub of Country Life butter. Desert in a tub. The lunch variant to band three includes a large desert on the tray. To band 2, you get a smaller desert. A cold roll, with a tub of Country Life butter. Small desert in a tub. This version of the desert is a small, mini, apple pie and cream. A plate with hot lamb noodles in oyster sauce. A slice of chocolate cake. A cheese plate with a slice of red Leicester and Brie. Grapes. A packet of three Oatcakes. A hot roll, with a tub of Country Life butter. Theres also a china coffee cup on the tray, with a pot of milk. The extras you get in Band 3 at dinner time really make a difference. The important variant here is the hot dinner - and the choice of two options - plus the decent desert and the cheese plate. 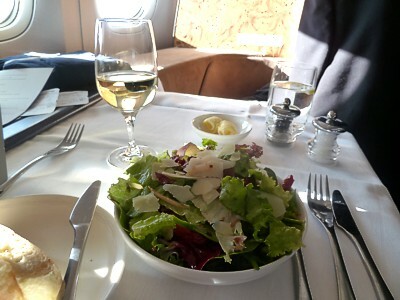 All in all it's a lovely dinner, and worth ensuring you are at flights that take off in the window for dinner time to ensure you get some decent food. 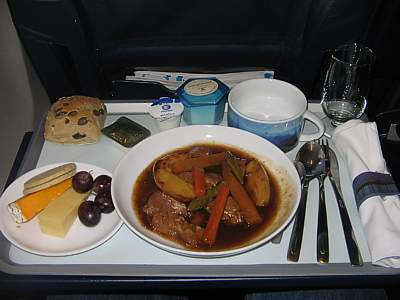 A plate with beef stew with carrots and potatoes in gravy. A pot of Do&Co Orange Possat. A slice of chocolate cake. A cheese plate with a slice of red Leicester and Cheddar. Grapes. A packet of two Oatcakes. A hot roll, with a tub of Country Life butter. Theres also a china coffee cup on the tray, with a pot of milk. 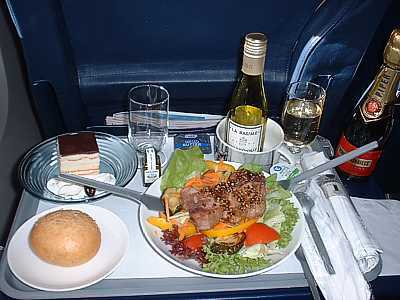 This a pretty good dinner, and with some destinations offering Club for only an extra fifty quid, makes it almost worthwhile. Nice and hot, with plenty of flavour. The pot of orange thing for desert is a bit of a disappointment, as it comes across as a bit cheap and masty - even though it's from Do&Co, so probably costs more than a decent slice of cake. Two well done lamb chops on a bed of salad with rocket, coleslaw, 4 baby tomatoes, drizzled with a small glass pot of Castello Monte-Vibiano olive oil. A hot roll, with a tub of Country Life butter, and a strange desert type thing, in custard. Theres also a china coffee cup on the tray, with a pot of milk. This was a real delight and the chops were really good having a a mild pepper dressing, the salad nice and crunchy. 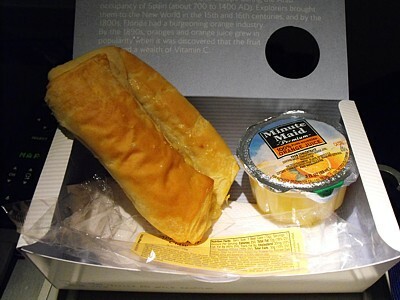 Plus for once an airline which doesn't just float on chicken! But bad marks for the desert. I'm not sure what it was, but it wasn't good! Three slices of Salami, two slices of Corgettes, two dollops of potato salad, and a sprinkling of rocket. A hot roll, with a tub of Country Life butter, and chocolate shortcake. There's also a china coffee cup on the tray, with a pot of milk. A pretty nice change, this lunch has a great tasting Salami, and it goes well with the potato salad. Oddly though, the corgettes were overcooked and awash with grease. Two stick of strips of beef with a wooden stick running through them, on a bed of courgettes and English salad with a few peppers, 4 baby tomatoes, drizzled with a small glass pot of Castello Monte-Vibiano olive oil. A hot roll, with a tub of French butter, and a cream and chocolate desert, with extra cream. Theres also a china coffee cup on the tray, with a pot of milk. A very good steak with real peppercorns having loads of flavour. The courgettes and peppers worked well with this, and English iceberg salad was pretty good too. 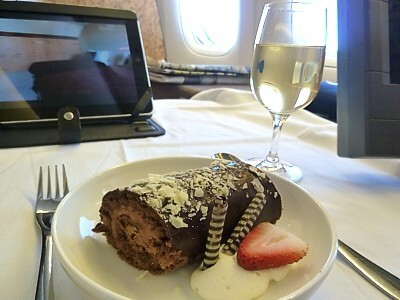 Saving the best to last, the desert was one to die for, lovely and creamy - and all this for an hour long flight! Five slices of chicken on a bed of Rocket salad with a few peppers, and sprinkled with cheese. 3 tomato slices, on which is potato salad in yellow sauce with herbs. A small glass pot of Castello Monte-Vibiano Tomato & chilli olive oil. A tub of Country Life butter, and a tub of Decantae water. A small chocolate. There's also a china coffee cup on the tray, with a pot of milk. 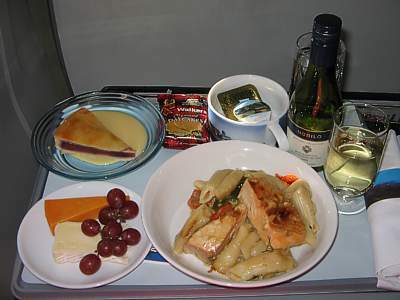 This is a truly delightful meal for a short 50 minute flight. 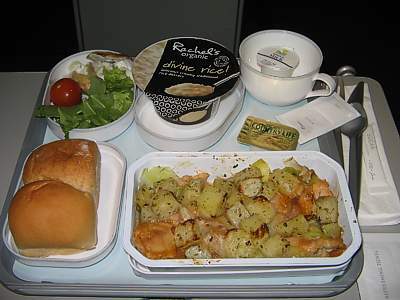 It is pretty spicy - more spicy than other aviation meals even on Asian carriers - but with loads of flavour, and even better in quite a large quantity. Six slices of chicken on a bed of Rocket salad with Feta cheese and a few peppers, sprinkled with pesto. 3 tomato slices. A small glass pot of Castello Monte-Vibiano Tomato & chilli olive oil. A tub of Country Life butter, and a hot roll. A tub of Decantae water. There's also a china coffee cup on the tray, with a pot of milk. A hot slice of apple pie, with cream. 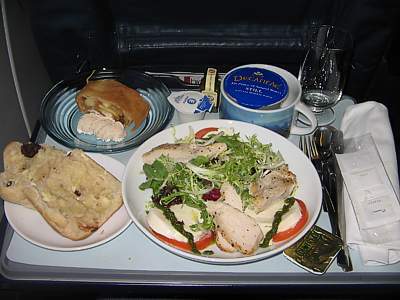 This is the slight variation on the chicken salad for longer 2 hour flights. There is slightly more chicken, a bit more cheese, and the chocolate is swapped for apple pie. Put of course there is the perk of a hot roll service. Six slices of sliced beef on a bed of Rocket salad with a few peppers. 3 tomato halves. A small glass pot of Castello Monte-Vibiano olive oil & vinegar mix. A tub of Country Life butter. A small chocolate bar. A hot roll. There's also a china coffee cup on the tray, with a pot of milk. If you're into beef, this is great. Alas, it is cold - and even worse, red and oosing blood on the inside. 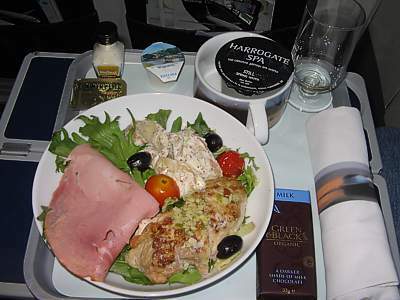 Forget mad cow disease, this is a question of BA putting it's foot into it's mouth, and shooting the catering. 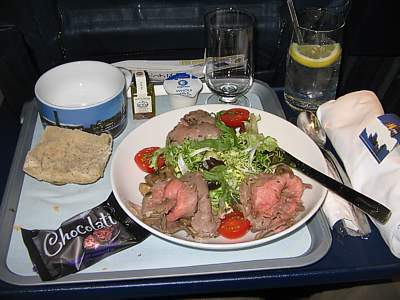 Many passengers were put off by this offering, particularly those who are unaware of the tight controls on UK beef, and were worried about walking into the walls. Good roll & butter though. A hold wing of chicken, cooked in spicey sauce. A slice of ham. Potato salad. A tomato. Two olives. On a bed of lettuce. A small glass pot of creamy spiced salad dressing. A tub of Country Life butter. A pot of Harrowgate water. There's also a china coffee cup on the tray, with a pot of milk. A small Green & Blacks organic chocolate bar. This is very good - a Gatwick special. Plenty of flavour in the chicken - cooked in its skin - with a decent slice of (English) ham, and a good salad to go with it. Decent dressing. Even a nice touch adding the chocolate bar. A slice of palma ham, and a slice of English ham, sprinked with cheese. A tomato. Two olives. On a bed of lettuce. A small glass pot of Castello Monte-Vibiano olive oil salad dressing. A tub of Country Life butter. A pot of Harrowgate water. A hot roll. There's also a china coffee cup on the tray, with a pot of milk. 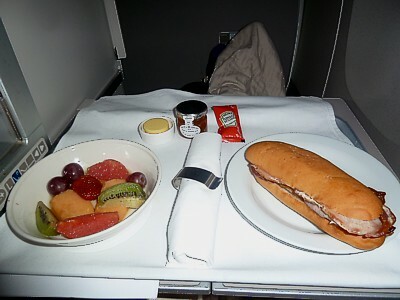 Not much here - this is more like a small snack, but you can stuff this lot inside the roll, making a good sandwich to take off the plane. Three large prawns on a bed of English salad with a few peppers, 3 tomatoes, half an egg and 4 olives, drizzled with a small glass pot of Castello Monte-Vibiano olive oil. A hot roll, with a tub of Country Life butter, and a tub of Decantae water. There's also a china coffee cup on the tray, with a pot of milk. This is the midmorning snack - aimed at offering something between the breakfast and lunch offerings. 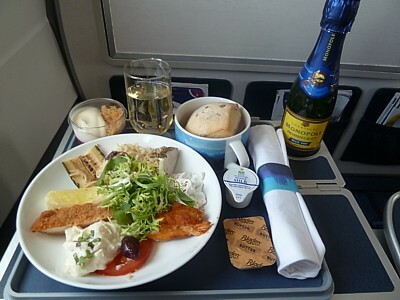 This makes travelling in Club Europe worthwhile - unless of course you don't like prawns. 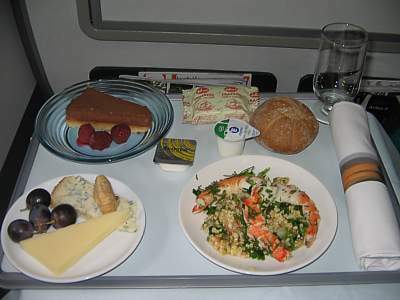 No alternative is offered with this meal on board. However there is more than enough to make this a worthwhile snack on a short 50 minute flight. Three large slivers of smoked salmon. Two squirts of cottage cheese. Rocket. An olive. Three baby tomatoes. A small bottle of lemon oil dressing. A pretty good lunch this, the salmon is top-notch, and has a light, delicate, flavour. Just right for a short one hour flight. 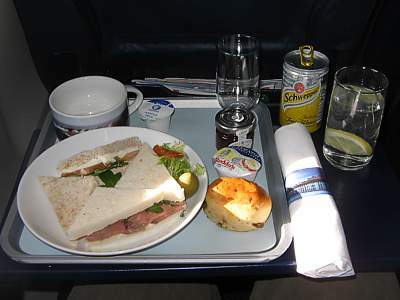 A plate with two salmon and two ham sandwiches. An olive. A hot scone, with a tub of clotted cream, and a tub of rasberry jam. There's also a china coffee cup on the tray, with a pot of milk. 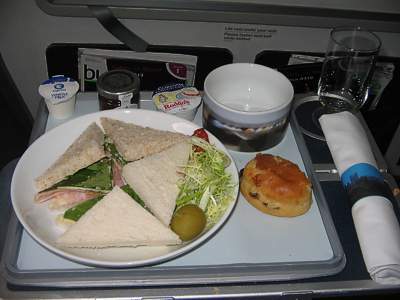 This is BA's much announced High Tea for the afternoon services. 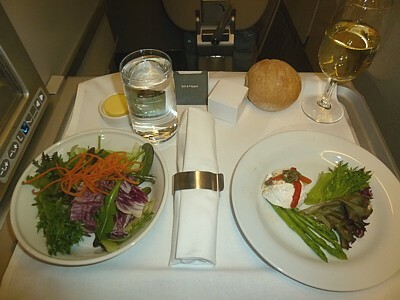 A few years ago this would have been served in economy - there is really very little quality or quantity to this. A plate with two cheese and two ham sandwiches. An olive. 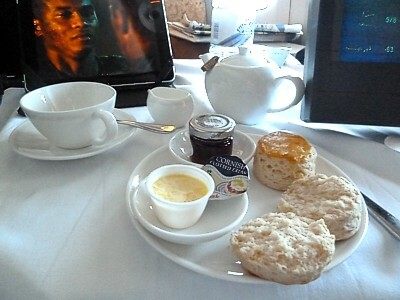 A hot scone, with a tub of clotted cream, and a tub of strawberry jam. There's also a china coffee cup on the tray, with a pot of milk. 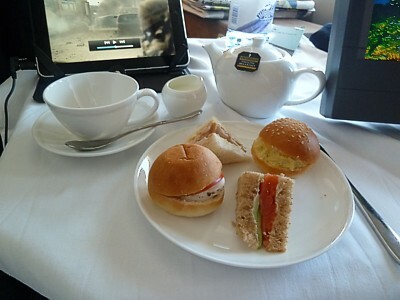 Yet another version of BA's High Tea for the afternoon services. There is little quality or quantity to this. A plate with two cheese & Watercress, and two ham & watercress sandwiches. An olive. Slivers of salad. A hot scone, with a tub of clotted cream, and a tub of cherry jam. There's also a china coffee cup on the tray, with a pot of milk. 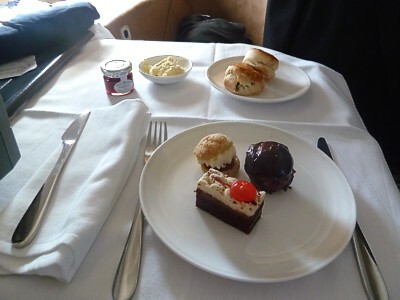 Yes, yet another version of BA's High Tea for the afternoon services. A circle of pepperoni pizza. A plate with one egg and one sweetcorn sandwich. An olive. A custard donut. This is BA's shorter hot dinner for evening services. The slice of pizza is reduced to little more than a canape, and can be little more than a mouthful. The desert looks bad, but is actually great. Plenty of scones are offered after the main meal service which is really little more than a light snack. Alas, you can't get any more jam or cream. A slice of pepperoni pizza. A plate with one salamon and one ham sandwich. An olive. A cherry muffin. This is BA's hot dinner for evening services. Hot however has slightly different meanings than you as a passenger might expect. Hot just means a slice of pizza. A slice of salmon on a bed of pasta with pesto and spinach. A cheese plate with two slices of cheese with a dozen grapes. A packet of Walkers Oatcakes. A slice of cherry cake. Not quite as good as the 2 part version, this still does the job and is very tasty. Three large prawns, on a bed of sweetcorn mixed with basil. This is part one of the two-parter Band 4 dinner service. 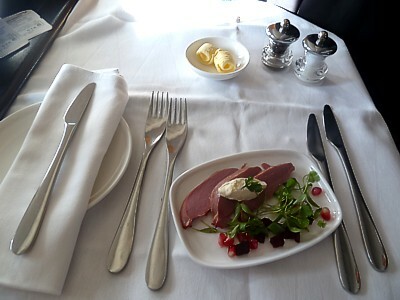 The starter is almost the size of a main course on some shorter services, and has been preped very well. It looks good - and tastes good too. 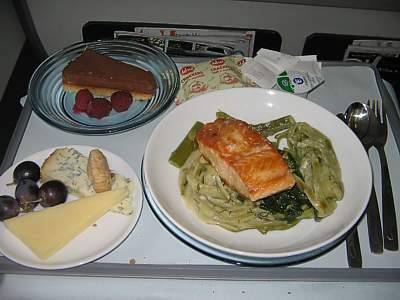 A slice of salmon on a bed of pasta with artichokes. A cheese plate with two slices of cheese with a walnut and four grapes. A packet of crackers. A slice of chocolate cake. Lovely, with both quality and quantity, this is just right for a long four hour flight. The chocolate cake isn't great - but this is made up for by the cheese plate. Two tomatos with a cheese topping, drizzled with pesto, and with rocket on top. The starter is very good, with lots of flavour. I was quite suprised with the pesto topping - that's unusual - but in context it works. Beef stew, with two chunks of beef, a carrot, a bean, and three potatos. A cheese plate with a chunk of cheddar and a chunk of brie, two digestive biscuits, and four grapes. A hot roll. Blackcurrant cheesecake. 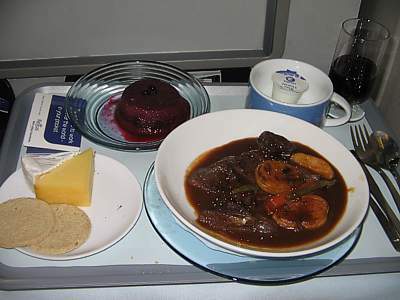 It's followed by beef stew, which was rather overcooked, chewy and tasteless. The cheese plate is marginally better than band 3 services, with more cheese. 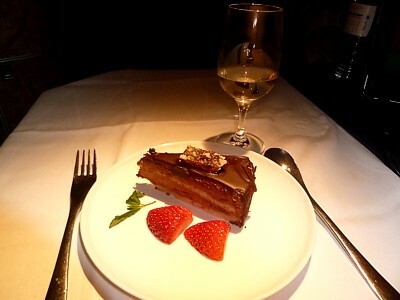 The cheesecake is lovely: this is definately the best part of the meal, with a light, delicate, flavour. Things are going downhill in Club Europe. You still get a menu - as shown here - but the appetisers are a little dodgy. In this case, there's one good one, and one bad. The feta in ham is great: a lovely starter. Alas the veggie version isn't up to standard, and should be shot on sight. Penne pasta with chicken and creamy pesto sauce with grilled asparagus. Creme caramel with fresh raspberries. Two slices of cheese with crackers. Hot roll. Butter. If you're looking for shorthaul chicken, you can't go wrong with this lot. 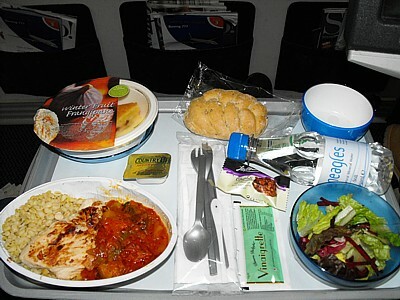 It is probably the best chicken you'll get on BA, with some very good pasta. I'm not so keen on the Creme caramel: previous BA cheesecake is much better, but you learn and live. 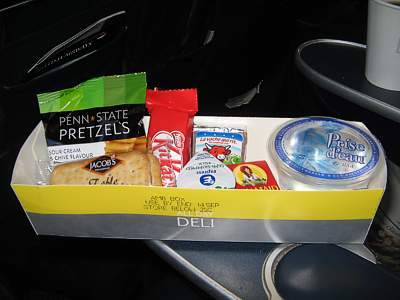 BA has revamped it's economy catering around Europe, and now offers the infamous "All Day Deli" snackbox, with sandwiches on all flights up to 3 hours duration. 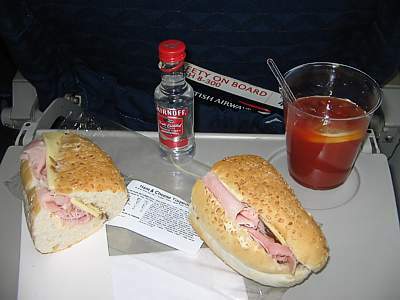 There are normally two types of sandwiches on each flight. 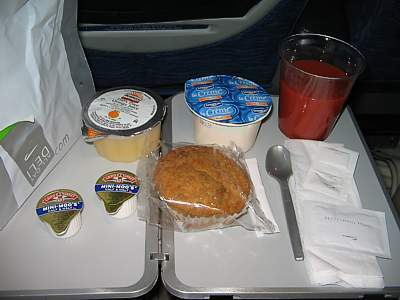 All cutlery is plastic - but you do get a hot breakfast, or sorts. 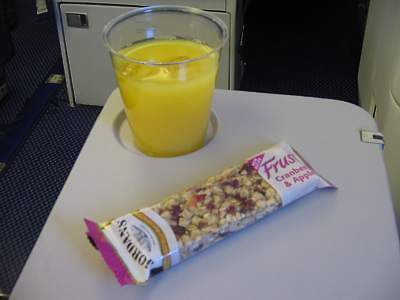 Note that on mid-morning flights all catering has been replaced by chocolate bars for most routes up to band 2. A hot baggette, with ham & and cheese. A tub of orange juice. A cup of tea. Well, it IS hot. And it does look like breakfast. So, technically, BA are in the clear. It's actually pretty good after a heavy night the night before - but I can't say I'd every want to go out and BUY this, even if I could. A Jordan's Apple and Cranberry bar. So this is it. And hour and half long flight, and you get - a bar. Little better than a schooltime snack, this dredful nadir is what BA has come down to on mid-mornings. Bad, it certainly is. It is known among frequent fliers as the "packet of bird seed". A half wrap with diced ham (English) in Mayonaise, with lettuce and peppers. Not great is it. But then again, for a flight with spends longer in the taxi than in the air, this is probably adequate. And in fact it's pretty good - certainly better than a bag of crisps - with lots of flavour. Sad that it comes with it's own Waste Bag - to encourage you to collect all your rubbish, and do the cleaners work for you. A half wrap with sliced cheese (Edam) in Mayonaise, with lettuce and peppers. Another small wrap - this time without the Waste Bag. Pretty good, lots of flavour. A roll with bacon & sausage mash. An orange & mango smoothy. A tub of milk. 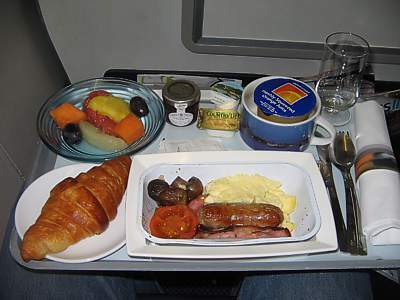 For a 2 hour breakfast flight you might be hoping for something a little larger, but this fills the spot. The smoothy is very good indeed. A packet of sandwiches with one half having coronation chicken, and the other having cheddar and lettuce. 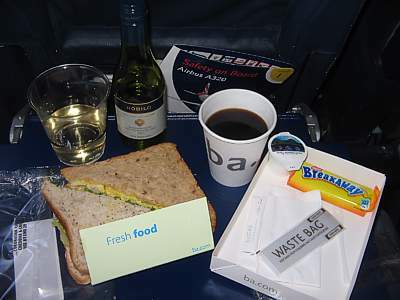 The latest variant on BA is to avoid carrying two types of sandwiches, and instead have two types in the same packet. A novel idea that saves a lot of time on shorter flights. The Coronation chicken is great. The cheddar less so. A half wrap with diced chicken in Mayonaise, with peppers and cucumber. A fruit pot. A tub of milk. 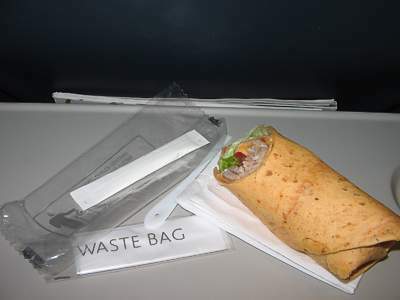 A larger wrap for a longer flight. Again, good quality, and tasting better too. Two ham sandwiches, with tomatoes and brown bread. A pot of chocolate moose. A tub of milk. 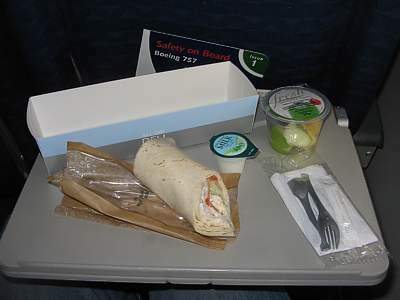 Longer flights get better sandwiches - no suprise there! And in the evening, you get a desert too. Alas, this is a pretty poor effort - British Rail in the seventies did better. A small cheese ham & lettuce roll. An apple. A mini bounty bar. A tub of orange juice. With no flavour in the roll, only one tiny sliver of ham, and err, that's about it, this is where the All Day Deli hits new lows, and you wonder if BA is becoming a no-frills carrier by default. It resembles the worst type of school dinner, and tastes like it. A small packet of cheese, and two Jacobs Cheese Crackers. A bag of Penn State Pretzels. A Kit Kat. A mini box of Sunmaid Raisins. A tub of water & milk. A real mini snack this, this small box is handed out with a rather embarased grin. It's general look and feeling is that of what a small American carrier would hand out. This box is an example of what is handed out on the airbridge in the August "dispute" season. A cheese (processed) sandwich with a slice of lettuce, a slice of tomato, with a thin smear of pickle, on white machine made bread. A packet of spicey bacon crisps, and a small pot of a cream eclair. 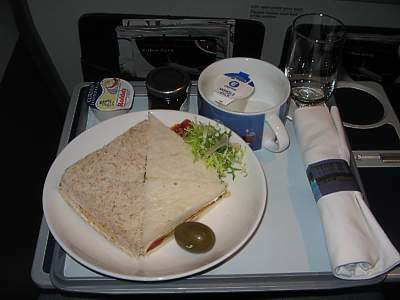 British Airways have successfully reinvented the 1960s British Rail sandwich on all flights - a major accomplishment, but not one that is appreciated by all their passengers on 3 hour flights. It's limp, with no taste whatsoever, and only goes so far to fill a hole. The crisps are way too spicey, and you'll be grateful for the free bar to avoid choking. However a major delight is the desert. Lovely with a light delicate flavour it slips down very nicely and wouldn't be out of place up the pointy end of the plane. A chicken torpedo sandwich with a slice of lettuce, buttered on one side. A slab of carrot cake, with a walnut on top, and a bowl of fruit salad with two slices of melon and two slices of pineapple. 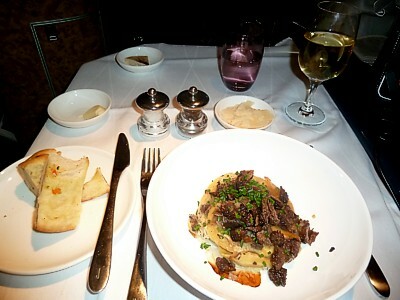 Flights to the UK are definitely better, as GateGormet (the makers of the food) are better at it than BA. Certainly the sandwich comes with plenty of chicken and the bread itself is pretty tasty - all in all its a pretty decent feed. 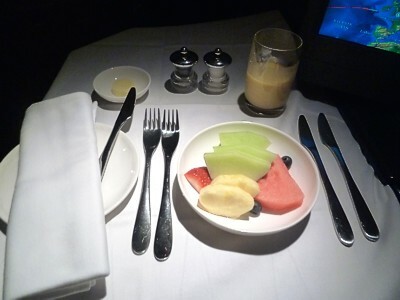 The fruit salad is ok - indeed it makes a good starter. 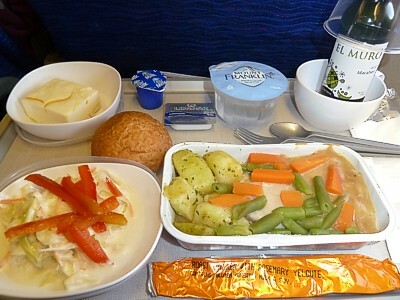 The carrot cake is especially good, and many people on the flight who didn't want a full dinner went for this with a cup of tea. Chicken, Bacon & Potatoes, in a pepper sauce with herbs. A salad with rocket, one tomato, and potato salad. A tub of Rachel's Organic divine rice. Two rolls (one white, one red). A tub of butter. 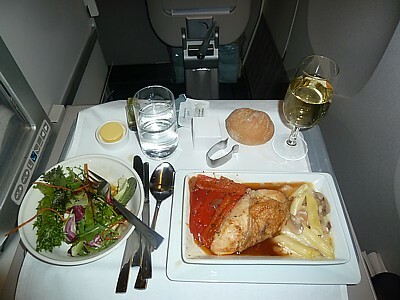 On the longest of flights around Europe, even in economy you can end up with a pretty decent feed. This comes hot, and tastes pretty good. 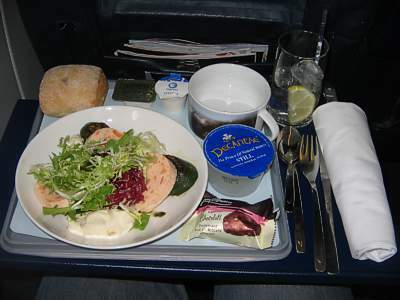 The salad is as good as anything offered in the front of the plane, and the rice pudding is a good way to finish. 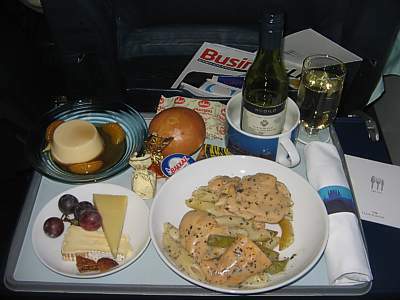 BA have experimented with axeing catering on some short routes. 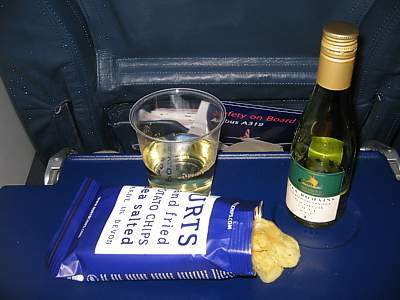 Passengers are to be offered crisps instead. And here it is - a packet of ready salted crisps. It is sad to see British Airways go down the low-cost route. Alas, it was to a certain extent inevitable. However for the price of a packet of crisps, they could surely have come up with small rolls instead? Slices of roast chicken, with potatoes in rosemary, with carrots and string beans. Coleslaw salad. Orange cheesecake. Cold roll. Butter. 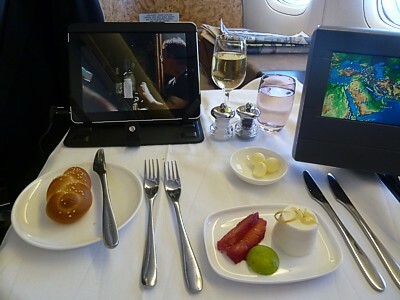 This really isn't bad at all, and certainly better than many airlines manage in economy. It has a fair bit of flavour, with the rosemary really bringing out the potatoes. The salad looks poor, but the coleslaw is refreshing: most of the effort seems to have gone into the cheesecake, which has lots of great tangy flavours and an amazing texture. On the whole, for economy, it can't be bettered. A slice of roast chicken, with whole grain rice and ratatouille vegitables. A bowl of salad leaves, with vinigratte dressing. Cold roll, butter. Winter fruit franipange. Chocolate biscuit. 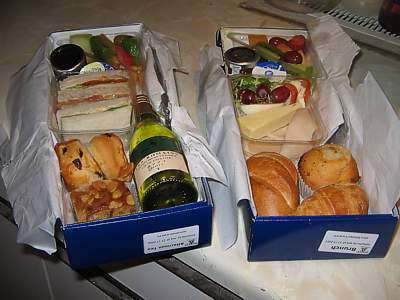 A box with salmon and cucumber, and cheese ploughmans sandwiches. Two slices of beef, with mashed potato, peas and a single carrot. A bowl of salad leaves drizzled with feta. Pecan pie. A cold roll. Kitkat (US Style). A jar of minute maid orange juice. Lumps of chicken with boiled potatoes, carrots and string beans in redwine gravy. A feta cheese salad, with lettice, tomatoes, and peppers. Banoffee pie, a hot roll with butter, a chocolate, and a bottle of Gleneagles water. This is a pretty good transatlantic offering, with lots of flavour in the chicken, and good veggies. The delight though is the salad - it's only small, but it was really well put together. 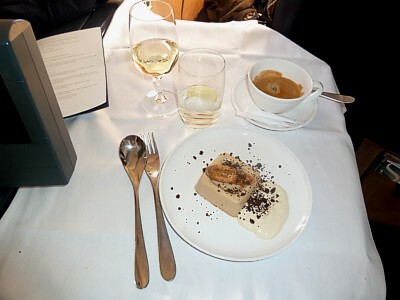 The Banoffee pie was very obviously factory made, and shipped out for the transatlantic market - but then, it tastes good and was just what most passengers on the flight wanted. Sliced chicken in gravy, with fried rice in a medley of mushrooms, carrots, beans and peppers. A chickpea, pea, and carrot salad. Cheesecake, a hot roll with butter, a Caramilk chocolate, and a bottle of Chrystal Geyser water. The chicken here is plain stodge, offering very little of good eating, but it does help to fill a hole. The salad is horrific, and can only have been dreamt up to tick a box to say there was one. The good bit here is the cheesecake. Light and creamy like it should be. Note that Crystal Geyser is not the bloke with too many diamonds about his person - it's the make of Alpine Spring Water (from Pitsburg). Chicken with rice (peas added into the rice), a light redwine curry sauce, salad with stringy carrots lettice, plus a pot of Blacks Vinagrette dressing. Cheesecake and custard, and a hot roll with butter. Good tasting, despite the rather off putting appearance. I can't fault either the quantity or the quality, however the roll was baked so hard it was difficult to make much of an indent. 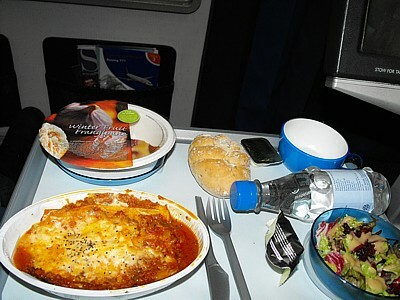 The delight was the cheesecake, which was light and delicate - and BA offered seconds for anyone still going hungry. 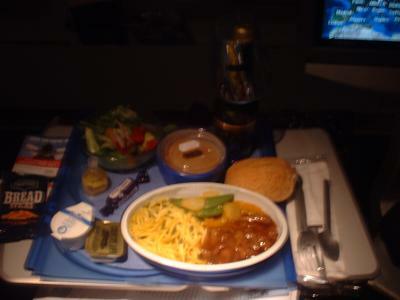 Chicken with pasta, a light curry sauce, salad with stringy carrots and cabbage, plus a pot of oil, a fruit flan with a kiwi fruit, and a hot roll, a time out chocolate wafer, and coffee. There is also a pot of water on the tray. BA do have the knack of serving food which doesn't look great, but which tastes fantastic. I don't know how they do this, but this chicken, which looked rubbery, was fantastic. The fruit flan, while tiny, was great, and the salad went down well too. There were continual offers of hot rolls, and I came to the conclusion that on BA, noone goes hungry. Half a breast of Chicken with diced bean curd, and one sprig of broccoli. Plus a hot roll, salad (with two (!) pots of vinegar & oil dressing) a chocolate desert, and a dairy milk chocolate. I'm really not convinced about this one. The chicken is tender, the broccoli good, and yet the combination is just a little, em, weird. 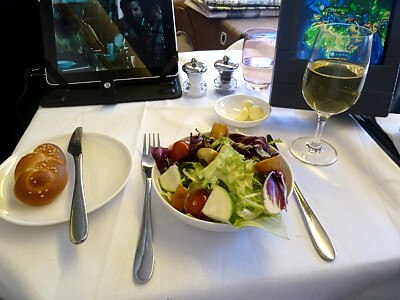 Mind you the salad is great, a lovely crisp combination of leaves and tomatoes. The desert, of the marble chocolate cake, is a delight, and it oooses off the tongue. Beef Strips, noodles, a few potatoes and string beans in a thick sauce. Plus a hot roll, salad (with extra vinegar & oil dressing) a chocolate desert, and a dairy milk chocolate. 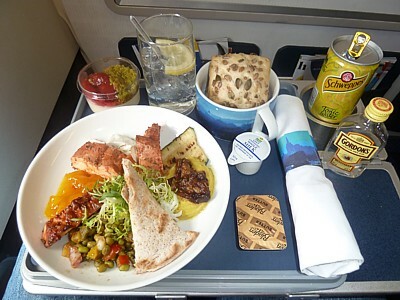 This is one of the best meals I've had on BA in a long time, and is much better than their "All Day Deli" on internal flights. Really tasty, even at gone midnight local time, it made the 13 hour flight wizz by. To start with you get an appetiser of Pfeiffers Bread Sticks and a spirit drink, then starting off with the salad it was fresh and crunchy - rather too much lettuce with just a few peppers, but the little dressing "bottle" (in plastic) really made a difference. 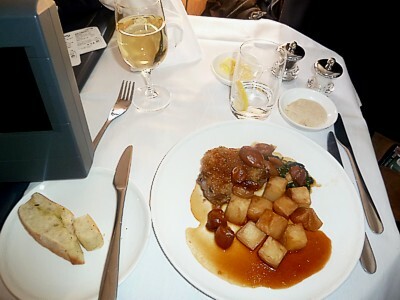 Then the main meal of beef was very good, nice and tender with lots of flavour. Desert was rather sickly, but there were continual offers of more bread rolls. Alternative meal on offer was fish. A full English breakfast, with sausage, 4 bacon strips, scrambled egg, 4 mushrooms and tomato. Plus a yogurt, roll (& marmalade) and (oddly!) a fairy cake. Plus orange juice & water on the tray. 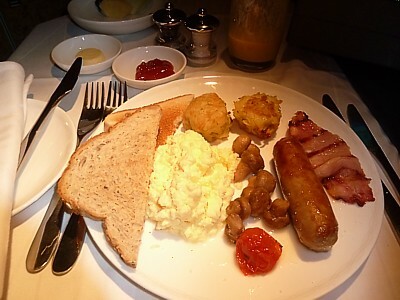 Its getting very hard to get a traditional English Breakfast on BA now, and this was a fairly good effort. The bacon was appalling, but the sausage very good. too few mushrooms, but really very good scrambled egg. The roll was hot, and there was plenty of choice in roll style. I'm still wondering about that fairy cake however... noone seemed to know what to do with theirs. 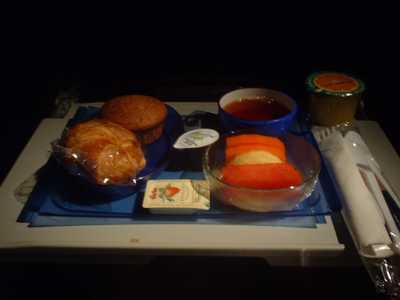 Four slices of melon, two halves of oranges, a croissant, fairy cake, orange marmalade, and butter. If you're being healthy, this is the one to go for. A great combination it really wakes you up after an overnight flight. The melon is tender, and the croissant, while warm, doesn't solidify. There are always plenty of offers of coffee and tea during the flight, but I find the tea a bit bitter - BA's coffee is great. A ham roll with tomato and lettuce. A pot Banston pickle, and a pot of water. 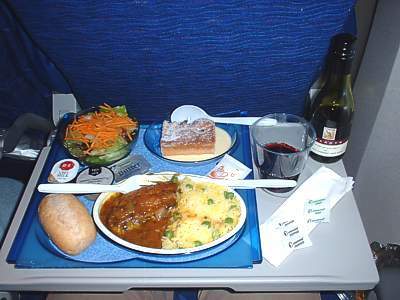 Heading transatlantic this is the offering is the second meal service if you fly east. 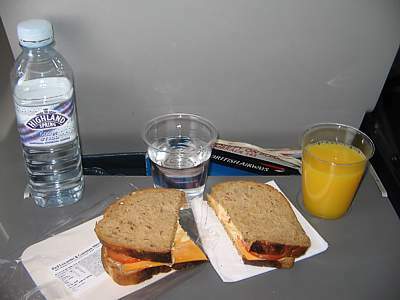 Actually it's just right, with a ham roll in the British Rail tradition. 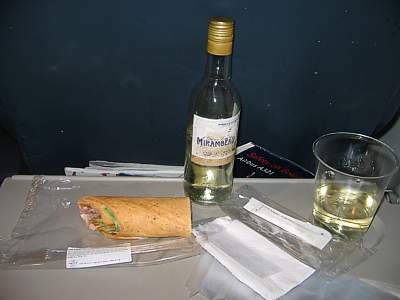 The pot of pickle is big, so you can spread lots over the ham - and soak up the wine from the flight. A small nut muffin. A yoghurt. A pot of orange juice. 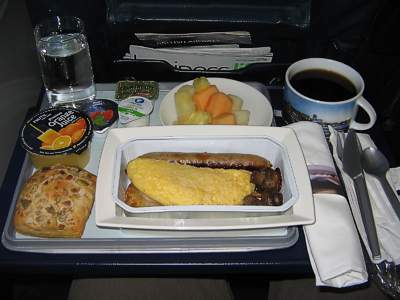 This horrific meal is what passes for the "All Day Deli" wakeup breakfast for economy on transatlantic flights. It's bad, really bad. You won't realise just how bad it is until you hear 200 passengers all moaning about it. 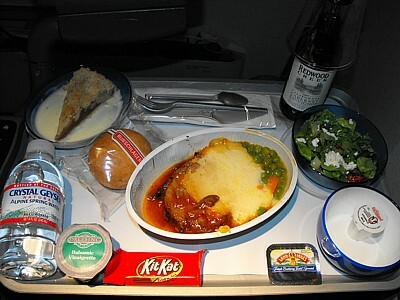 It doesn't help that this is served and hour and a half before landing, so you get this at what feels like 3 o'clock at night, just when your stomach is rumbling and you get desperate for some decent food. Avoid. Buying sandwiches from the airport is a much better idea. 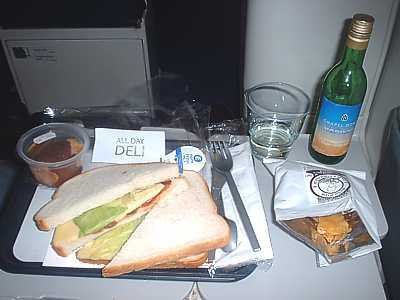 These were offered as no-frills services, with a buy on board menu which was handed out on take-off (details in the box on the right). However, this brand no longer exists. 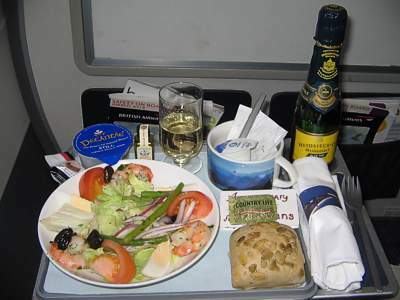 On the few domestic services BA still offers, BA only offers an economy cabin. A pack of 'street food' nibbles. Hamster food on board for a one hour flight. 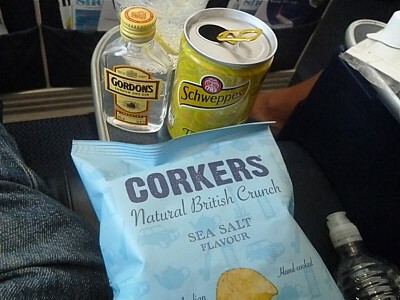 A pack of 'Corkers' crisps. Great. 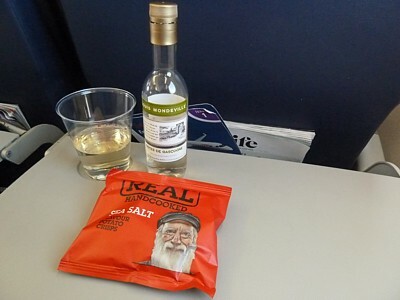 BA now just hands out crisps. A pack of 'sea salt' crisps. I give up. Eat in the lounge. Two sandwiches, with grated cheddar mixed with cottage cheese, on brown bread. A Breakaway bar. A tub of water & milk. 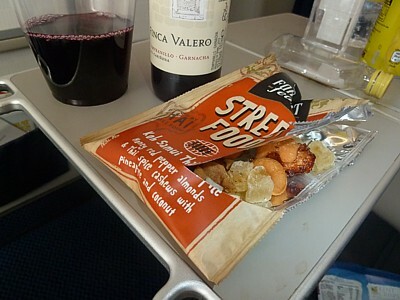 This is a what BA hands out at dinner time on some hour long domestic flights - and it's not bad, with lots of flavour in the different cheese. 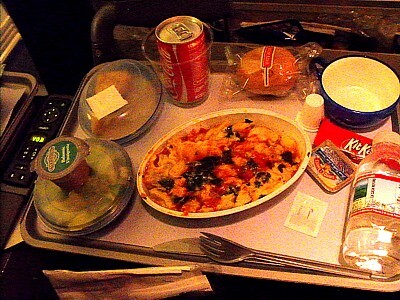 Admitedly the mixture is a bit odd, but you can let BA get away with it, if only because there is still free food. 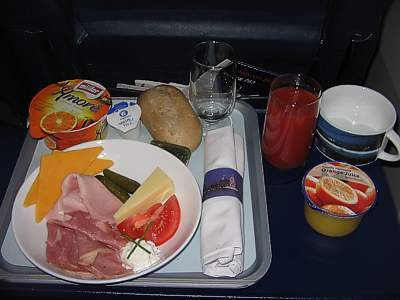 I'm curious though - has anyone seen any Breakaway bars anywhere other than in an airline meal? Two sandwiches, with a slab of red Leicester cheese, on a bed of coleslaw, with brown bread. 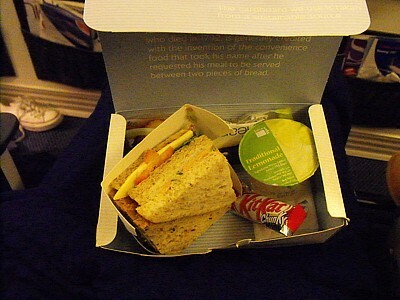 On Domestic flights using the Embraers, you don't even get a box - its a packet of sandwiches, and that's it. 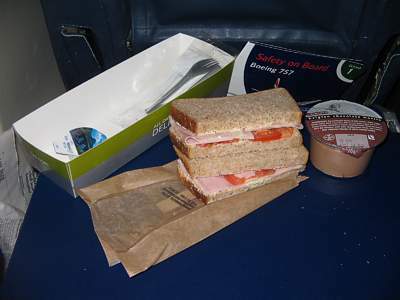 These sandwiches are shortly to disappear on Domestic flights, leaving them just on European short haul. A long thin soft roll, containing a slice of ham and a slice of cheddar cheese. 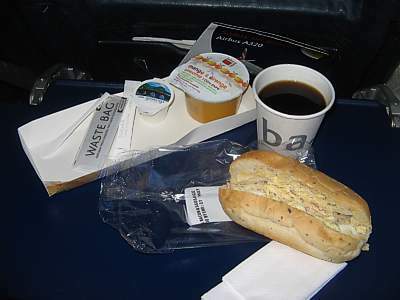 On Domestic flights using Dash 8s, even the sandwiches disappear, leaving just small torpedos at lunchtime. A torilla wrap containing diced chicken, with coleslaw. 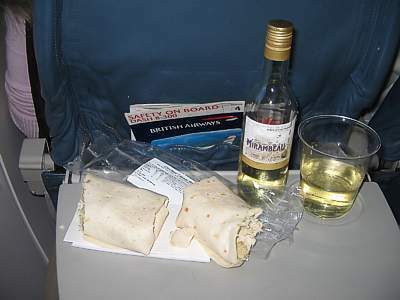 Definately the best choice on domestic flights, the chicken ceasar wrap is more than enough for a short half hour flight. Brunch Box A triangular tub of two slices of ham, two slices of cheddar, egg & tomato slices, and three grapes, on a bed of rocket. A triangular tub of fruit salad. A crossant, a roll, a muffin, a tub of butter, a jar of marmalade, and a pot of milk. Afternoon Tea Three sandwiches, with salmon, egg & chicken. A triangular tub of fruit salad. Two scones and chunk of fruitcake, a tub of clotted cream, a jar of marmalade, and a pot of milk. 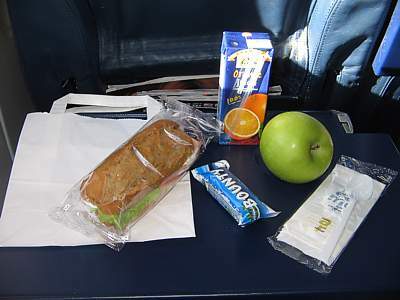 Many business class passengers like these food packs, which are handed out in the August dispute season.